When I lived in Bogotá years ago I frequented a small restaurant called Aquí en Santafe in Chapinero (Carrera 7 # 62-63). If you weren’t looking for it you would probably walk right past it, because at the time the only thing that made it stand out on the busy street was the dark red door. The restaurant served traditional Colombian cuisine, and my favorite thing to order was the arepas. They had an amazing assortment of arepa toppings, and the arepa with avocado and cheese was my favorite. The school cafeteria also served them, and the teachers could usually count on finding some arepas and aji for breakfast in the teachers lounge. Arepas are typical Colombian breads made from white or yellow precooked cornmeal known as masarepa (Brands: Goya, P.A.N.). They are very easy to prepare and make great snacks, breakfast, or appetizers. Arepas range in size from minis about 1-1/2 inches across to large plate sized, and I usually make a medium size about 3 inches across which is a good breakfast size. You can make them with or without cheese or just enjoy them with butter and salt or top them with aji, the Colombian salsa. The aji I remember from the school was green and slightly spicy. Some ajis have tomatoes, but this one just had onions, peppers, cilantro, and a bit of vinegar. I make aji at home using a bit of lime instead of the vinegar, and I tone down the heat a bit for the boys with an Anaheim pepper. For a spicier version of aji, use 2 jalapeño peppers with seeds instead of Anaheim. If you really want to set your head on fire, add a habanero. Like cornmeal, masarepa is naturally gluten-free, though it might be processed in facilities that also process wheat products. Make sure you check the labels carefully to be sure. Makes 6 medium (3-inch) or 12 small arepas. 1. AREPAS – In the medium bowl, toss together the arepa flour, cheese, and salt, then stir in the water until well mixed. Let the mixture stand until enough water is absorbed for a soft dough to form, about 2 to 3 minutes. 2. Divide the dough into 6 pieces. Form the pieces into balls and flatten between your palms, gently pressing to form a 1/4-inch-thick patties, then gently press around side to eliminate cracks. Place the shaped arepas on wax paper. 3. Heat oil in the cast-iron skillet over medium heat until it shimmers, then fry arepas in 2 batches, turning over once, until deep golden in patches, about 8 to 10 minutes total per batch. Drain on paper towels. 4. AJI – Put all the ingredients in a food processor or blender and process until slightly blended, but still a bit chunky. Dollop on top of the cooked arepas. Use 2 jalapeño peppers instead of Anaheim. To make it really hot, add a habanero pepper. Those look delicious! It is speciality I really love. Nice sauce. I love arepas. We ate them in San Francisco at a little place called Pica Pica. After they are cooked they open them and stuff them with all sorts of tasty things. My favorite is pulled pork, avocado, tomato and aioli. Another favorite is shredded beef and black beans with avocado. Every time I head to SF I head to this restaurant. It’s totally gluten free. I even bought my son an arepa maker so he could make these fast and easy to make for school lunches. Glad we now have another recipe to try! I just tried Arepas for the first time at BlogHer food! They were quite good (fortunatley dairy-free so I could have them), but insanely filling. 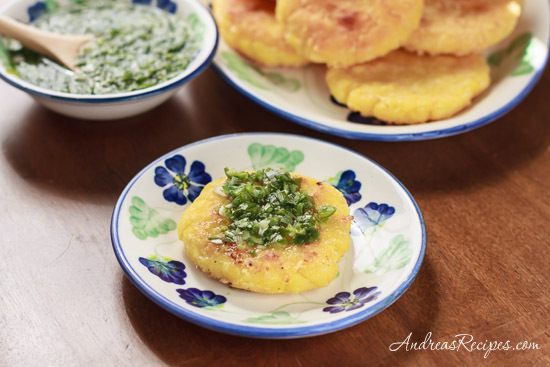 I attempted arepas years ago and still have a bag of masa harina precocida in the pantry… your version with cheese definitley looks more interesting that the one I made.